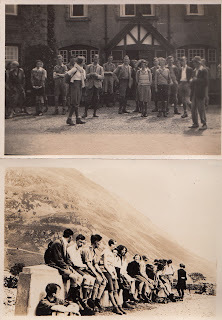 About a month ago I picked up these wonderful photographs of a climbing meet in the Lake District in the early 1930s. They show the kind of group walking/climbing meets that were organised at that time. Some were organised by climbing clubs and others were organised by holiday organisations. These kind of group holidays were often where young people were first introduced to the sport and where they got to rub shoulders with people from the serious climbing clubs, such as the Alpine Club (founded 1857), the Rucksack Club (founded 1902), Fell and Rock Climbing Club (founded 1907), and the women-only Pinnacle Club (founded 1921). Often people would take the train at the end of the working week and head up to the Lake District by train. Often friends would meet on the train and get a taxi together to the hostel where everyone would be staying. 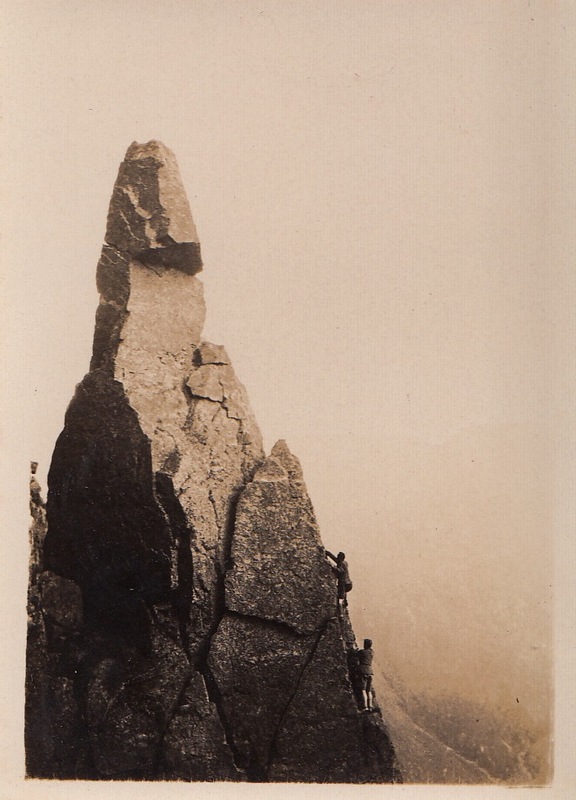 It is interesting how there was still a mix of climbing clothing in this period. 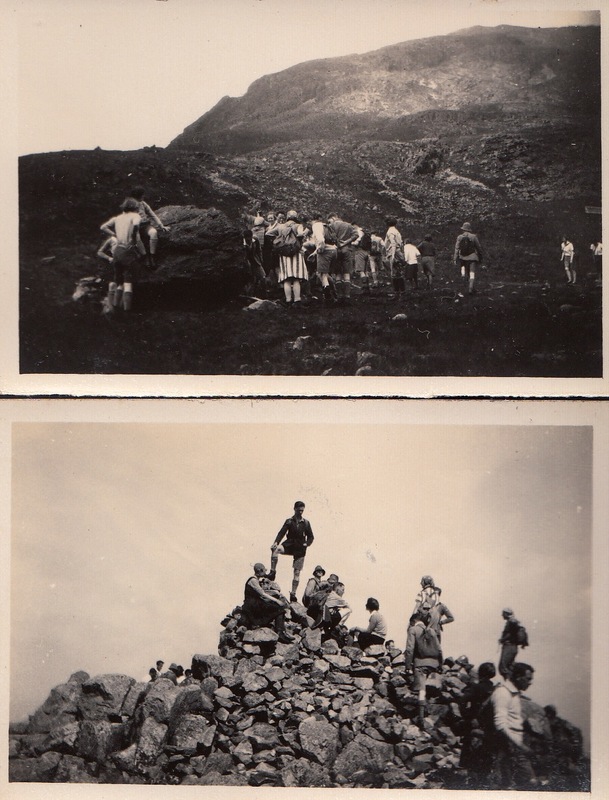 Serious women climbers were certainly wearing shorts by this time or tweed knickerbockers. By the 1930s climbers were also experimenting with rubber soles and shoes on the serious rock faces. 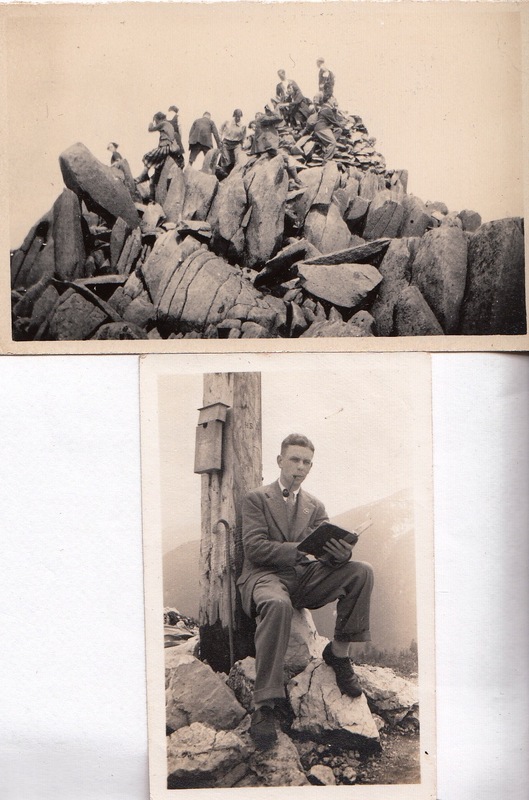 Written on the back of the photographs is Wasdale and Scawfell, both important in the history of English mountaineering. The small village of Wasdale lies within reach of several notable climbs: Scafell Pike, Sca Fell, Kirk Fell, Great Gable, and Pillar, all where many notable climbers cut their climbing teeth so to speak. 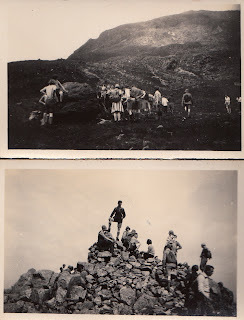 The final photographs show what one is supposed to do on a summit. After wondering around for a bit, have a rest with your tobacco pipe and write about one's adventures in a climbing diary. Perfect. The group walking/climbing meets of that time must have been a lot of fun. I love that last picture--it is so different from what you would see today.